The present clock is a magnificent piece of work made in 1903 by Thwaites and Reed of Clerkenwell. It has a cast-iron bed, and chimes the bells in the pattern known as Westminster Chimes. It chimes the quarters on bells 4, 5, 6 & 9 and the hours on the Tenor using hammers which strike the outside of the bells. These can be “barred off” to avoid the hammers colliding with the bells during ringing. 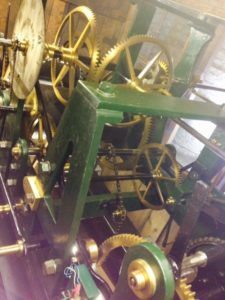 The clock uses a “double three-legged gravity escapement” (pictured, right) which allows for great accuracy, where wind pressure on the external hands does not influence the timekeeping. Originally the clock was hand-wound. It became fully automatic when it was fitted with an automatic winding mechanism in 1972, donated by an anonymous townsman of Beckenham. This winding mechanism was replaced in 1986 and still serves to this day. The clock drives gilt cast-iron skeleton dials on the South and West faces of the Tower with gilt copper hands. Little is known about the clock in the old tower. 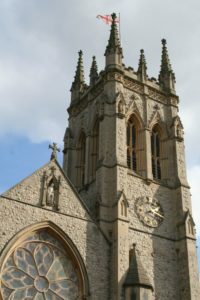 It is probable that a clock existed in 1750 because it is recorded that “between five and six in the morning on the 8th of March 1750, a violent earthquake took place in London during which the clock hammers were heard to strike the bells in Beckenham and Croydon”. What is known, is that a clock certainly existed during the 1800s. The setting dial and exterior hands of the old clock hang on display in the current Ringing Room. They are not dated by the maker, but the setting dial has the following inscriptions: “REPAIRED 1820 BARRAUDS, CORNHILL, LONDON” and “REPD BY E BUTCHER BECKENHAM 1871”.